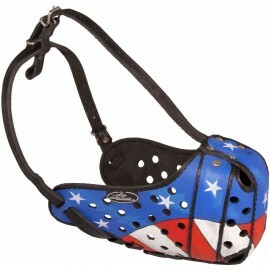 Very comfortable, perfectly ventilated and super stylish leather dog muzzle for Labrador. Padded with natural Nappa. 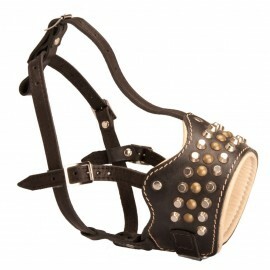 Adorned with nickel-plated spikes and brass studs. Inimitable style. 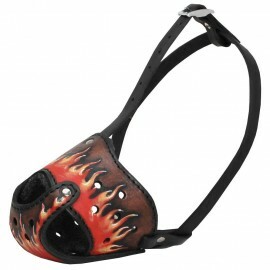 Buckle in the bottom part allows regulating the muzzle size. 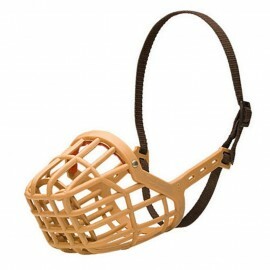 This Labrador muzzle doesn't prevent biting, it's intended for calm dogs! Handmade leather muzzle with open nose for calm Labrador. The dog can bark, pant, drink and even bite being muzzled! Don't use for aggressive dogs! Marvelous design. Row of brass studs and two rows of nickel-plated cones. Selected leather. Padded with soft Nappa. Bottom buckle for muzzle size regulation. Super quality! 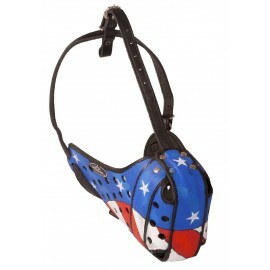 Open mouth dog muzzle of genuine leather for Labrador. Nappa lined for exceptional comfort. Brass studded for luxury look. Anti-bark muzzle. Maximum comfortable. Regulated. Custom-made. Please note, the dog can bite being with this leather muzzle! Handmade and hand painted leather dog muzzle for Labrador. American Pride ornament. Water-resistant and non-toxic paints. Extremely durable and comfortable. Unique design. Adjustable. Good airflow. Felt-lined inside. Perfect for USA patriots and travellers! 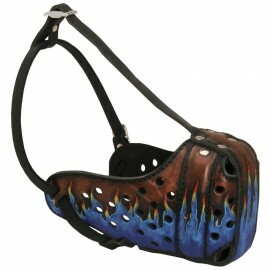 Labrador training and walking leather muzzle with blue flame hand painting. The pattern is made with special resistant to water and sunlight paints. Non-toxic. Safe. Secure. Super strong construction. Natural leather. Felt lining. Perfect airflow. Eye-catching design.